This is part one of several blogs on The Best garden features for 2019. There were simply to many features to place in one blog. You have my wife Noela to thank for that. She turns simple ideas into great one’s. What are the best garden features for 2019? All gardens will look better if you have some features in them. These features will help visitors to focus on those sections of your garden you would like them to explore. They can come in all sorts of shapes, sizes and style, and they don’t have to cost a fortune. In this article I will show you some features and ornaments in our garden. Many of them have come from my clients when they wanted a clean up of their garden sheds, or from the local recycling center. Some have caught our eye at local garden centers and did cost us some money. The purpose of this blog is to show you how some simple items can make a difference in your garden. I am blessed to have a wonderful partner, who has a fantastic eye for the obscure. Often we will be at the recycling center and she will point to an item, that I would have totally overlooked, and state, that will look great in our rose garden, or herb garden, or where ever. I have to admit that sometimes I look at it and think, you’re crazy, that will look ridiculous. Just as often, when we finally take it home, I find out I’m totally wrong. You know what us males are like, we hate being wrong. These ladders are just the thing. 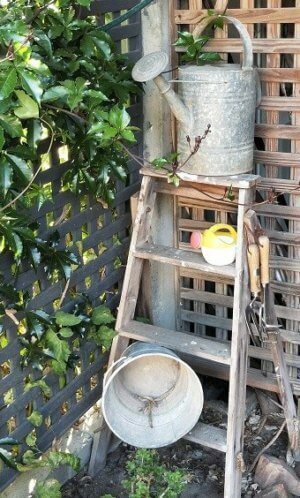 One of the most popular items in gardens today are old wooden step ladders. Our garden now has three of them. These old ladders came from some of my older customers who wanted them gone. So I would do a big clean up for them and take the items home for Noela to peruse. No way would I take them straight to the tip without her seeing them. I learned long ago that it is a lot wiser to let her have the final judgment on an item. Will it be taken away to oblivion , or can it be reused in ours, or another persons garden. Her eye for detail is a lot more efficient than mine. So back to the ladders. 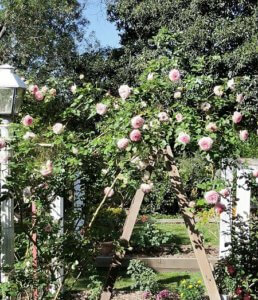 The first ladder was placed in our Rose garden. It had several purposes. Not only was it put there to attract one’s attention to a beautiful climbing Rose, in this case it was also helping to hold the rose up. The climber that needed this support was our gorgeous ‘Pierre de Ronsard’ . I was concerned that the ladder was far to big and wouldn’t look good in this particular spot. I was wrong again. Once placed there, and secured, it looked great. Noela went a step further with this ladder (excuse the pun), and placed pot plants on the steps. The reasons for doing this were very logical. 1). It would keep the grand kids off the ladder. They might be tempted to climb it. 2). The pots would add that extra splash of color when the roses weren’t in bloom. None of these ladders cost us any money. Could you think of any better way to highlight a section of the garden without it costing you a fortune? 3). They would provide yet another focal point for visitors. Keeping there eyes and minds ever entertained. Our federation style home was moved to the spot it now sits on many years ago. Unfortunately the only way it could fit on what is a large but narrow and long block, was to place it back the front on the site. Hence, the back of the house faces the front. The madness around this decision was thought out many years before we bought it. At the time it must have seemed like a great idea as the large veranda, or porch, faced the back, which gave one a fantastic view of the river. This view however is mostly obscured today by rubbish growing on other properties that sit between us and the river. When we purchased the property it was crying out for both maintenance and garden development. We were in our element because this is what we loved doing the most. There were many little alcoves around the building. One of these was begging for a feature and existed very near to the back steps. One of the smaller ladders soon became a center point in this tiny area. You will notice on the photo that Noela has filled it with other little items, such as an old watering can, old tin bucket and some hand tools. You will also notice a little plastic watering can. This belongs to our younger grandson, who uses it when he visits, to help grandma water her plants. This little corner looked empty and neglected before Noela came up with this great idea. The only items that cost money were the steel garden tools that we use in our raised garden beds. The rest were free. If you are finding it difficult to locate small items to place on your ladder than you can follow this link to my features review and choose one from the list. I won’t be revealing any pictures of this ladder as it has only been placed in the center of a lawned area to protect a tree seedling we planted there. I use this area of the garden to park my utility trailer and other equipment I use in my gardening business. We wanted a tree planted in the middle that would eventually provide shade for a future sitting area. Hopefully it will be ready when I retire in about one and a half years time (or 14 months 14 days from the writing of this article to be precise). Noela was determined that the little tree should be protected from possible damage by me, so she insisted we place an old spare ladder we had stored under our house over the top of it. It looks rather strange but does the job. I doubt I would have run over the seedling, I think Noela was worrying for nothing. Or was she? A Bicycle or Two: A Feature, or a quick escape! Noela always wanted a bicycle in our garden. You know, one of those old one’s painted either pink or white. One day I was cleaning a yard for some older friends when I noticed two old, or should I say very old, bicycles leaning up against the side fence. I had never seen these bikes in their yard before so I asked about them. They informed me that they were throwing them out. I pounced on this opportunity and told them I would be happy to take them off there hands, for a reasonable amount of money. They told me that they didn’t want any money and could I just take them. They informed me that they were about to take them to our local recycling center and that if I were to remove them from their yard they would be ever grateful. I was ecstatic. I wasn’t sure what Noela would do with the bicycles but I was positive she would be rapt to get not one, but two great old bikes. When I got home and took the bikes off the trailer my wife was already outside waiting, as if she anticipated that I had a surprise for her. Her eyes lit up immediately she saw the bikes. That very afternoon she managed to place the bike against our shed and starting adding smaller features on and around it. She informed me that the whole picture would look a lot better once the plants had grown to a reasonable size. From where I stood it looked pretty good already. 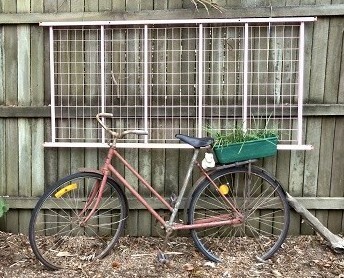 She simply leaned it against the shed, placed pots of color around it, and added some seedlings in a basket on the front near the handle bars. Another dead spot now looks fantastic. There is a little way to go before the flowers cascade down the handle bars and the little rose on the right grows over the top, but I think you can imagine what it will look like. This bike has some way to go before it can be totally accepted as a good garden feature. But at this early stage I trust Noela and what she is trying to achieve. Apparently a stephanotis vine will be planted behind it, grow up the trellis (which is an old bed base, she loves using these), and fall slightly over the bike. The Common name of this plant is ‘Bridal Veil’, because of its cascading, highly perfumed flowers that are often used in wedding bouquets. But just a word of warning, if you should decide to use this flower in a wedding situation, make sure the bride isn’t allergic to the perfume or pollen. Other plants will also be placed in containers around the bike. I wanted you to see this project at its very early stage to understand how easy it is to put together. You could paint the bike if you wish, but I know that Noela prefers the natural color in came in. So far this little area has cost us next to nothing. We paid $5 for the bed base at a recycling center, and as I said above, the bike was free. Not all garden ornaments or features come for free. Every now and than one hits your eye that you simply need to purchase for that special spot in the garden. This is exactly what happened to us one day when we visited a garden center looking for plants. 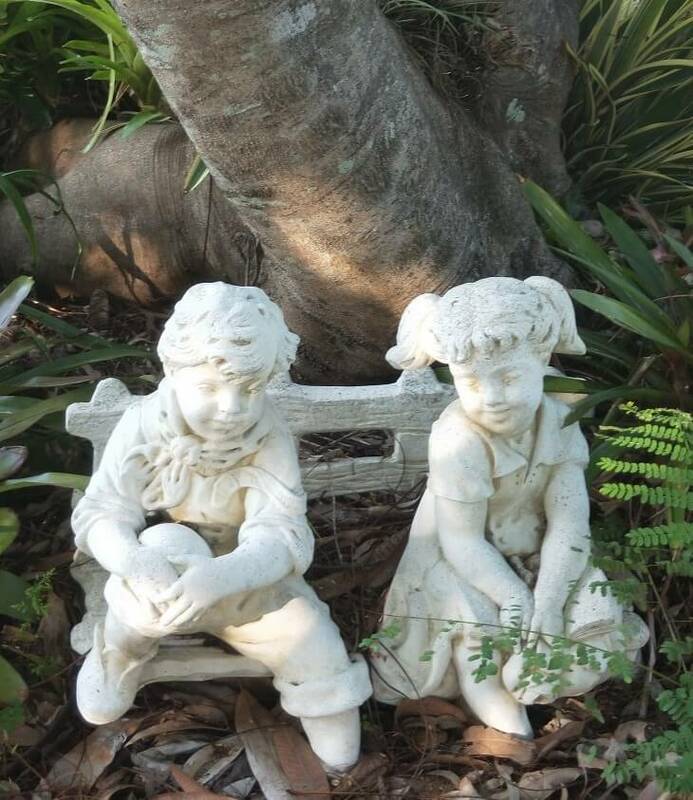 We were wandering around the center when Noela noticed the ‘two kids on a bench’ statue in the store. She looked at me and commented ‘I know where that will fit perfectly’ she said. I looked a bit dumb founded. I’m not really a statue sort of person but had to admit that this one looked rather cute. I asked her where she wanted to place it, she told me to trust her and it would be a surprise. When we got it home I was told to take it to the Poinciana tree. This tree is located in our back garden. and is surrounded by bromeliads and ferns. When I put it where she told me to I had to admit it looked fantastic. Placing these sorts of features strategically within the garden helps to draw the visitors eyes to new spots that they might otherwise have missed. As I have mentioned in other blogs. It helps the garden to become an adventure for visitors. You must admit. They do look rather cute. Just one more Necessary feature. I simply had to add one more feature for today. This is a very necessary ornament in any garden setting. Like most gardens, as ours matures, and the trees, shrubs and plants grow, it becomes an attractant to animals and birds. We have a number of different finch species, along with other birds, that not only visit out garden but choose it to build their nests and raise their young. It is important that you provide a source of water for these little birds if you want them to stay. They love the security of shrubs and flowers so make sure you partially hide the feature from the prying eyes of predators. 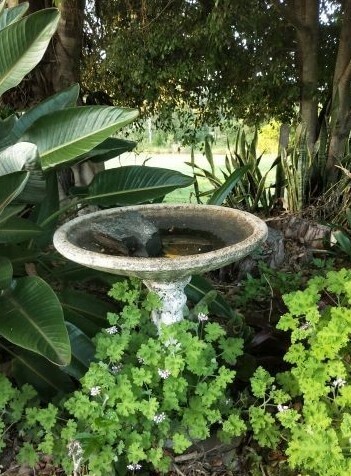 Our garden encompasses approximately and acre of land (or approximately 4,000 square mtrs) so we have a number of bird baths situated throughout it. This particular one was purchased from a local source and is made of concrete. It’s a rather heavy material but this means there’s little chance of it being knocked over. Notice how it is well hidden within the garden shrubbery. The little birds in particular should feel very safe in this setting. There are numerous other ways you can provide water for animals and birds. Maybe you could build a small pond. or purchase a small waterfall feature. Hopefully what I’ve shown you on my blog today will inspire you to check if your garden needs some features added. Sometimes it only takes a small amount of imagination. Remember to return to my website in the near future when I will reveal some further interesting features that my ever imaginative wife Noela has added to our garden. They will surprise you. In the meantime check out your local recycling center for ideas. You may also like to check out some ornaments you can purchase for your garden by following this link. I hope you enjoyed my article on the best garden features for 2019 part 1. Part 2 will arrive shortly. I always appreciate comments. Or maybe you would like to tell me about your garden features. You can either leave a comment below, or for a more private conversation, you can contact me on the ‘Contact Us’ button at the top of the web page. This article has some great gardening ideas for any gardening people out there. I loved reading this article. Out of everything I loved the ladder idea. It was so new for me but yet very useful and essential. This article was very easy to understand and read. Thank you so much for showing this article. Thank for this article , i must say it is a job well done. Gardening is something almost every does, you see a beautiful flower you might want to keep this article has brought in more than an idea but series of ideas on how to do them, Thanks for making me appreciate gardening, it is another way to make me happy. Hey Jim What inspired you to create these cool looking garens? 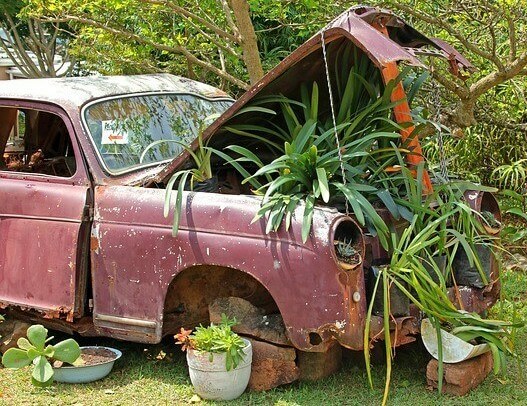 I like the way you tookand built a garden around an old car as well as a Bicycle and a latter Ido like this siteThe Best Garden Features for 2019. Part 1.and I am looking forward to see part 2.I have growed tomatos in a tire rim beforeand they turned out ok.I liked this so muchI will refer others. Hello, I apologize I am getting a 523 error trying to open this page! Make sure everything is ok with your website! 🙂 I know I’ve had a few issues where my site wouldn’t load. Did you check with support by chance? Maybe they can help you out! All the best and good luck to you! Being a newbie gardener, I never really thought about using features to draw people to specific parts of my garden. I honestly never would have thought to use items like ladders or bicycles to add more character to my yard but I have to say they look great! I also have a bird bath in the front garden and it is truly a great feature because you get to see some beautiful birds splashing around in the water. I will definitely take a page from your book and incorporate a few other features to draw attention to certain parts of the garden. These are great ideas that have never crossed my mind and it shows how creative you are. I see it as turning discarded objects into beautiful scenes which make it so attractive. I like bicycle number. The position really fits and I will be looking forward to reading the part 2 of this garden feature tips. I’ve gotten some insights from your creativity and I’m glad to have come across this article. Wow, who would have thought you could make an old car look so good again. Also love your idea with the ladders, especially for the climbing plants. Looks so attractive. And to keep your grand children’s watering cans available when they come to help in the garden. The bikes look wonderful, and a great excuse not to throw out the rusty ones we seem to collect up. Somehow the bought statues don’t look as good anymore as your other ideas. Thank you for this inspiring post. Will definitely go and see what I can recycle from our garage to our garden. Your wife Noela sounds like a real creative person! She has such a great eye for decorating. I absolutely loved these garden features for 2019. If I had to pick a favorite, I seriously don’t know which one it would be. i love how the ladders look, and it’s so great how you’ve recycled them. What a great way to use something that would normally be thrown away. I think my favorite garden feature is that first bicycle. That is gorgeous! There is someone who lives pretty close to me who has a bike in their front yard as a decorative piece and I’ve always really liked it. Yours is even more beautiful! Great post and thanks for awesome ideas! Me and my wife were looking into redesigning our garden for next spring/summer and that ladder number 1 looks so good, I want something similar now! 🙂 My wife loves first bicycle idea! Thanks for sharing your beautiful garden with the world! Hey Jim. Thank you for sharing these great ideas on bringing your garden to life. I would never have thought using simple things as features could make such a huge difference in how the garden looks. I’ll definitely give your suggestions a go as my garden looks really dull right now. Thanks again for the great article! I’ll keep an eye out for your following posts! Your blog has inspired many people with green thumbs .You have a wonderful wife who knows how to recycle discarded items like ladders, bicycles and what nought and give them a new lease of life. She deserves praise for her creative ideas and has made gardening a lovely pastime. Many people are just too lazy to dispose of their old items properly and just dump them indiscriminately in public places, making them an eyesore.Even the old car body has been recycled. Your garden has also been turned into a bird and insect sanctuary! Her creative eco-friendly ideas will certainly inspire many people who are interested in beautifying their homes with discarded items. A tour of your beautiful garden will an eye-opener and a great learning experience. Happy Gardening to both of you! I would advise you about your garden, well honestly some time see this kind of garden I think may be it’s accidentally grow. But today when I first checked out your content that is to say it is really a great look and creative work. I don’t have a garden at my house neither I am a gardener but it’s interesting to me and thank you for sharing your post. How wonderful, that you have such a creative wife! Your ideas are great. Recycling castoff items and turning them into part of a beautiful garden is an excellent idea. I’ve done the same with small items (such as colanders or old pots) but not with big ones. I do remember, though, that we had an old skiff that was no longer usable, and we turned it into a flower bed. It is really good to find such “retired” articles that can be turned into something eyecatching. Great ideas! Everyone wants to own a fancy and a unique garden in their own backyard and this article has everything you needed to have an unique garden. Out of all these idea I personally loved the bicycle one. It looks really unique and it looks really elegant and beautiful with flowers. I’m definitely going to use that idea in my own backyard. Thank you so much for sharing this article. My grandparents own a garden in Memphis, Tn and they always say the seasons really do make it hard for them to grown certain vegetables because they don’t have a greenhouse and something to control the temperature. I like how you have yours simple and with character. It says about you and you like biking which is also cool. My grandparents bike together a lot. It seems you’ve maximized the space you have. Thanks so much for sharing! I love this idea for garden decorations! I can’t wait to see what other recommendations you have in store. Ladders and bicycles are definitely decorations I wouldn’t even though of and I love the pictures to show how it really does add a visual value to your gardening decorations tips. I love your utilization of the ladders, and I wonder if there are plants (like vines) that could almost incorporate your bikes even further into the garden (or would that take away from the design?) Would love to hear your feedback on it. Thank you for sharing Grandpa’s Green Thumb! This is a very creative gardening project. I can tell you and your enjoy doing this. This is the best way to appreciate nature. I am sure you don’t have stress because you have very beautiful garden where just by walking through you can release stress! My wife is good at gardening and this is what she has to see. I will bookmark the website so i can show her tomorrow morning. . There are so many ideas we can pick from your garden. 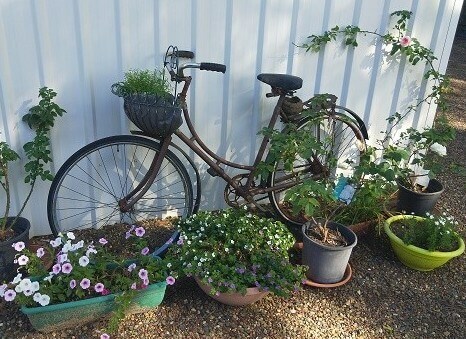 I love the setting of plants with the bicycle! Very nice indeed. Thank you for sharing this article you make me remember back when I was a little kid, I used to go to work for this lady on her back yard and was so amazed what this lady was able to do with a simple or junk stuff turned on something great for her garden. I really like the way you did the ladder number one to hold the roses great idea. I think you inspired more people to try something different on their garden. Using Pierre de Ronsard to cover the ladder, that’s genius Jim! I have a metal ladder at home, the retractable one that can go very high up and the kids tend to always play with it to climb not just trees but balconies and I have no idea how to stop them. Whenever I hide it, they find it again and use it either to climb higher places or do acrobatics with them. Putting pots and growing vines, that’ll stop them! Yeah. I can’t agree with you that gardening is such a beautiful thing to engage in. Aside the aesthetic values and the beautification, it also has a lot more to it. You really did a good job here alongside your partner Neola. I like the way you positioned the bicycle 1. I will look around if I can get some objects to start gardening with. These little items that we add to our gardens sure give our gardens that nice look. I definitely do not like my garden to just be plain containing only plants. I like adding up some few items to make it look more appealing to the eyes and just so luck would have it, some of the items placed in the garden actually help the garden itself. Like the ladder you suggested sure has a great look as the rose climbs up them and they also serve the purpose of holding up the rose – talk about killing two birds with one stone. You have some great suggestions here that I would really like to make use of. Thanks for such an awesome write-up. I love sites like this that will get me posted on the gardening features and things relating to gardening because lately I have been thinking of going into gardening , so I think I will start following you in order to get posted. Thanks for sharing this article,because I really love the gardening ideas and I think I should try them out here. Hi Jim,Wow, what an excellent post, I really enjoyed the reading! I was looking for some information on how to decorate my garden. I really like the idea of the ladder. I’ll try this in my garden. I also have an old bicycle in my garage, which I don’t use anymore. I was just a bit skeptical about the bike because I have artificial grass in my garden. Do you think that if the bicycle stands for a long time on my artificial grass, it will cause some damages to it?Thank you for this useful article! Nice post, I can see that you are such an experienced person when it comes to gardening business. Reading your blog in recent time has been encouraging me to love garden and flowers. Keeping garden in Africa is not common. In fact only the few rich people that have travelled abroad. Some of them spend a lot to maintain the garden. But I have realized that I can keep small garden in my rented apartment. I love bicycle feature in a garden. I love other feature that will not be needing much money.